The usage of technology in auditing has evolved since the 1950s and the density is growing exponentially. Auditing technology refers to any tool that can enhance the auditor’s capacity to perform an audit task. The most prominent type of audit technology being used is generalized audit (GAS) under the category of computer-assisted audit tools and techniques (CAATTs). Consistent with the proliferation of GAS usage in auditing, graduates are expected to possess sufficient knowledge and skills pertaining to these tools in order to meet the demand by the auditing profession. However, many universities outside America that offer auditing subjects have yet to integrate audit technology into the teaching of these courses. Consequently, the graduates’ awareness and skills in using the audit technology is very limited. This study has twofold objectives. First, it explores the opportunities, methodologies and challenges in incorporating GAS into the teaching of auditing courses to accounting undergraduates through review of extant literature. Second it analyses the effect of the teaching methodology that we choose on the students’ learning process. Data on the students’ responses are collected using survey questionnaires as well as students’ test performance. Our preliminary findings reveal that students responded positively towards the opportunity and benefits of GAS in the auditing process. We employed hands-on practical usage of the software during tutorial classes as a methodology to impart GAS usage skills. Among the challenges encountered were the assessment method, software availability and licensing. MAHZAN, Nurmazilah et al. 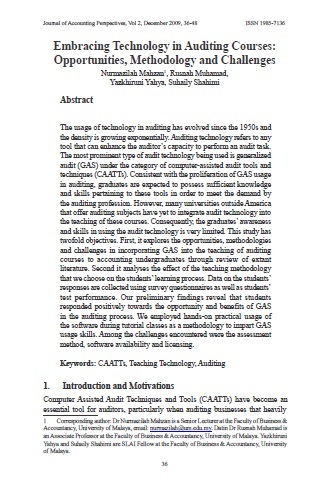 Embracing Technology in Auditing Courses: Opportunities, Methodology and Challenges. Asian Journal of Accounting Perspectives, [S.l. ], v. 2, n. 1, p. 36-48, dec. 2009. ISSN 0128-0384. Available at: <https://ajap.um.edu.my/article/view/3644>. Date accessed: 23 apr. 2019.